BERLIN, Germany (CNN) -- A polar bear attacked a woman at Berlin Zoo Friday afternoon after she climbed a fence and jumped into its habitat during feeding time, police said Saturday. 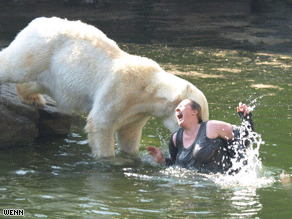 The bear attacks the woman during feeding time. One adult polar bit her several times after she plunged into the moat, police said. Zoo workers tossed rescue rings toward the woman to hoist her out and distract polar bears swimming nearby, said Goerg Gebhard, a Berlin police officer. At one point the woman fell back into the water and was grabbed by a bear before she was eventually hoisted to safety. "They saved her life," Gebhard told CNN. It's unclear why the woman entered the bear habitat, but police issued her a citation for trespassing. Berlin Zoo is home to Knut, the first polar bear to be born there in over 30 years. The bear became a huge talking point in Germany when his mother gave birth to him in December 2006.